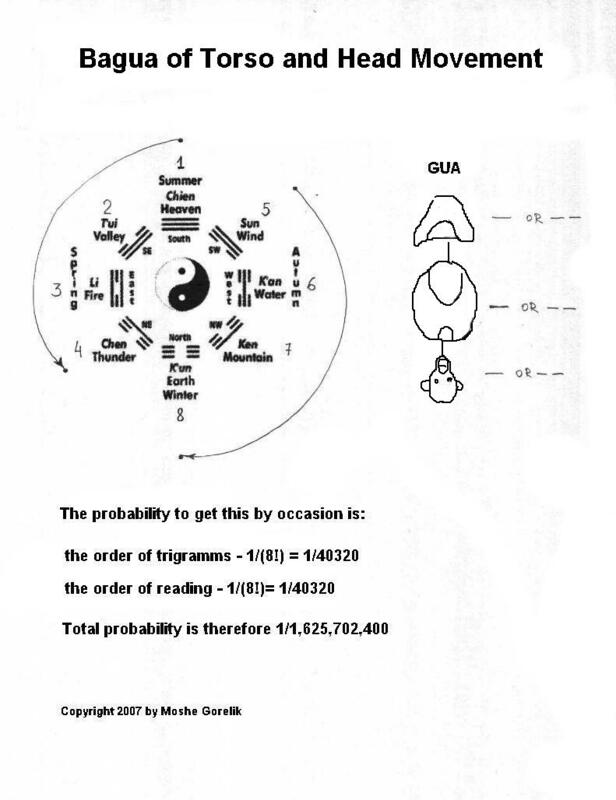 I already published my theory and proved that ancient Daoist principles and symbols belong to ancient biomechanics as Emperor Fuxi formulated it. According to this theory the phases of cycle of motion received in ancient times poetic expression. 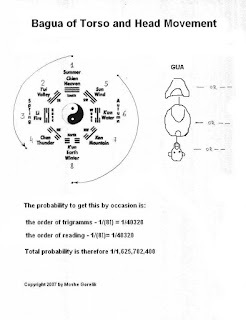 Emperor Fuxi, which name means propagator or disseminator in Hebrew (interesting that the name of his wife is Nuqva, which means female in Hebrew) invented Fuxi Bagua or eight trigrams of Fuxi and used these trigrams in his biomechanical model. Four first trigrams are Sky, Lake, Fire, Thunder. 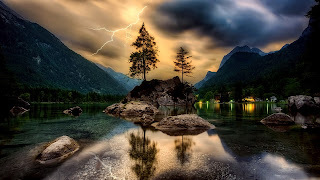 It means that from sky to lake stroke lightning and sounded thunder. Four next trigrams are Wind, Water, Mountain, Earth. It means that Thunder produced Wind and Wind expelled Water from the Lake to the edge of cliff (Mountain) and then Water fell on the Earth. This story is a poetic expression of the subsequent phases of natural human motion according to Emperor Fuxi. Biomechanically, in modern language, these two series of four trigrams encoding two SAIMs (Self Annihilating Inertial Motion). In FORMLESS FLOWTM (abbreviation – FF) these two SAIMs are called Fire and Water phases of natural motion. In FF Natural Martial Art these two phases produce Fire punch or kick and Water punch or kick. 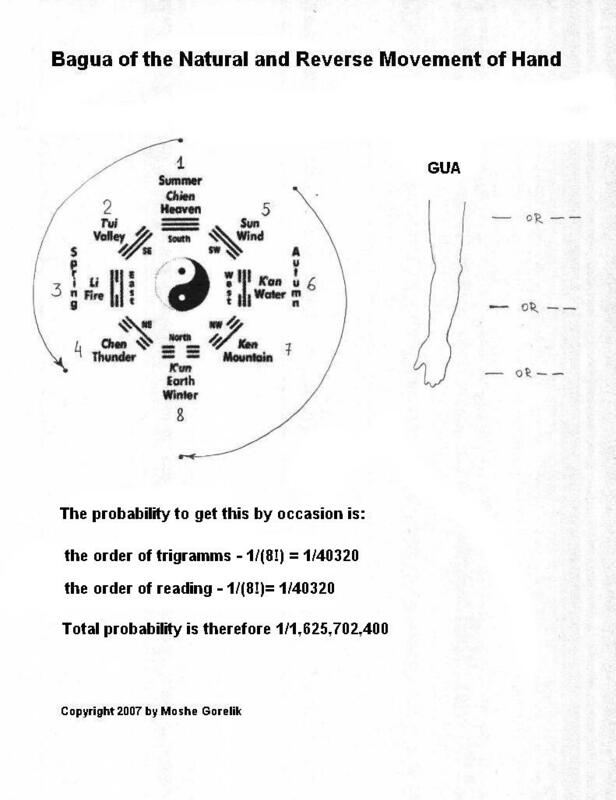 One of the very important terms in Daoism are microcosmic and macrocosmic orbits. 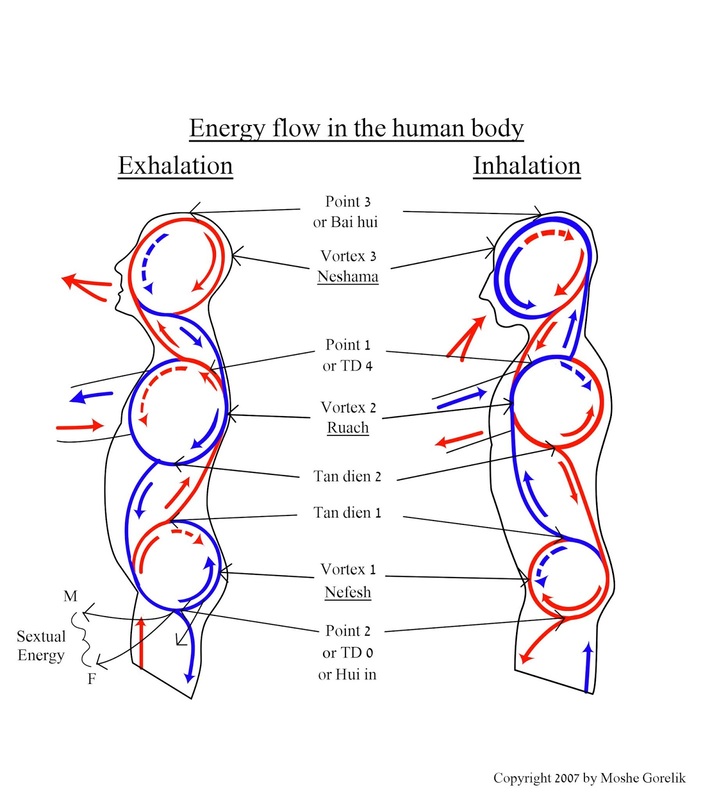 Usually the term microcosmic orbit is applied to the intrinsic energy or Chi orbit of the torso with head. FF uses it in more general form. Microcosmic orbit stands for motion of each torso with head, arms and legs. Their movements are encoded by eight Fuxi trigrams or Fuxi Bagua. Macrocosmic orbit stands for motion of torso with head AND arms and legs. Their movements are encoded by eight Fuxi hexagrams. In torso with head, arms, legs each this is a balance between first 4 trigrams (Fire or Sky) and last 4 trigrams (Water or Earth). This is a balance of cyclical motion along the axis of time during one cycle. This is a SAIM of each separate part – torso with head, arms and legs in biomechanical terms. These SAIMs are expression of fractality of the body structure and its motion. It's a property of microcosmic orbit. The motion of each part can be represented by eight Fuxi hexagrams if the motion of fingers or lower jaw is encoded by trigrams. This will increase the dimension of fractal representing them. 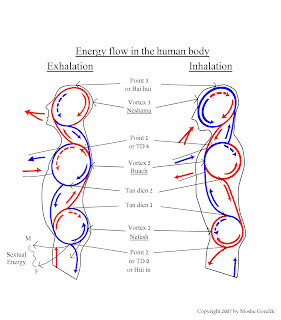 In torso with head AND arms and legs this a balance between Fire and Water (also between Sky and Earth) or between the trigrams WITHIN hexagram. 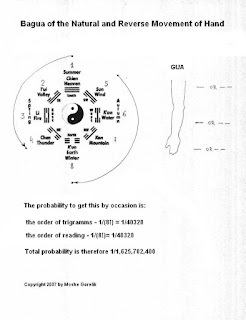 If the motion of fingers or lower jaw is encoded by trigrams the whole body's motion is represented by enneagrams (ennea is nine in Greek language). This is a balance in space within the whole body or overall balance of the body. This balance is an expression of fractality of the full body structure and its motion in higher dimension then in microcosmic orbit. It's a property of macrocosmic orbit. These balances between Fire and Water, Sky and Earth, Yin and Yang provide Harmony in natural motion in space in time. The terms Fire and Water, Sky and Earth, Yang and Yin have their cultural and social origin in Ancient China and can be very convenient for comprehension and describing this phenomenon even in our days.